Yesterday I blogged about how the Trump White House doctored the video recording of Putin responding to the question about whether Putin wanted Trump to win in White House intentionally doctors video of Trump-Putin press conference. 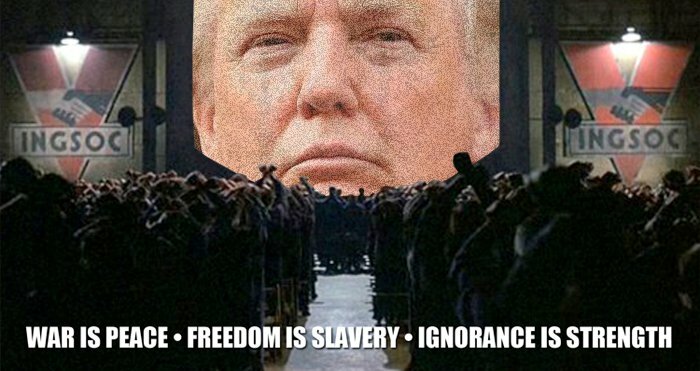 This morning AZBlueMeanie at Blog for Arizona covers that bit of revisionism but in the interesting context of Trump as Orwellian: Dezinformatsiya or doublespeak, Donald Trump is Orwellian. Here is the Blue Meanie’s record of what happened. All this is indeed Orwellian. AZBlueMeanie quotes some passages from 1984 apropos to the White House’s revision of history. The party told you to reject the evidence of your eyes and ears. It was their final, most essential command. [Winston Smith’s] heart sank as he thought of the enormous power arrayed against him, the ease with which any Party intellectual would overthrow him in debate, the subtle arguments which he would not be able to understand, much less answer. And yet he was in the right! They were wrong and he was right. Trump, his White House, and the Kremlin understand that all too well. President Trump claimed Tuesday, without evidence, that the Kremlin will support Democrats in the November midterm election, debuting a new line on Russian interference as the uproar over his shifting stances on the issue enters its second week. Trump made the claim in a late-morning tweet eight days after he held a joint news conference in Helsinki with Russian President Vladi­mir Putin, who acknowledged there that he had wanted Trump to win in 2016.